On April 11-12, two Russian SU-24 fighter-bombers made repeated low-level passes over the USS Donald Cook, an American destroyer sailing in the Baltic Sea. The ship’s crew recorded the incidents and the Navy released them online. The video reminds one of the antics of Maverick and Goose, two naval aviators harassing Russian fighter planes in the 1986 motion picture “Top Gun.” During the Cold War, such incidents were common. If we are, as some think, in a new Cold War, they will occur more frequently, so it’s important that we understand them. First, it’s important to understand what this incident and a similar one in the Black Sea last April were not. While ill-advised and dangerous, they were not acts of war. The USS Donald’s commanding officer and its crew knew the SU-24s were unarmed. Had they been armed and had their surface-to-air missile radars locked on, the Donald could have shot them down initiating a serious confrontation between the world’s two superpowers. Second, it’s unimaginable that Russian pilots would do this as a form of hijinks. A gust of wind or unanticipated mechanical failure could have proven deadly. Furthermore, no local commander would sanction such behavior on his own accord. This was a message from Vladimir Putin. Third, it was not wise, especially since a Polish helicopter was attempting to land on the destroyer’s small flight deck as part of a refueling effort. Helicopters are very complex and inherently difficult to fly, especially hovering over a moving platform on a rolling sea. Harassment by two very powerful twin-engine jets presents more than a distraction. The jet blast could have sent the helicopter crashing into the Donald, causing destruction, death, and precipitating an international crisis. Under different circumstances, the Donald’s commander might have engaged and destroyed aircraft acting in this manner. For instance, it would be foolish for a pair of Iranian pilots to pull this stunt given the high tension in the Persian Gulf. While blasting a pair of Iranian pilots to smithereens might start a war, since Iran does not yet possess nuclear weapons, it wouldn’t mean Armageddon. It is likely a Navy ship commander would shoot down a civilian aircraft engaged in such behavior to eliminate the threat of a suicide attack. The Russians picked the USS Donald for two reasons. First, it was operating in what Moscow considers its territory. That it was co-operating with a Polish helicopter is also significant because during the last Cold War Poland’s communist regime was a Russian ally in the now defunct Warsaw Pact. In this case, tomcat Putin is marking his territory and backing it up with an angry hiss. 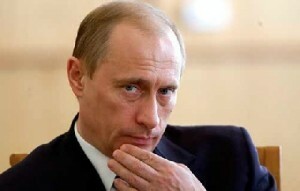 Second, Putin also is testing U.S. resolve. If the Obama administration reacts weakly, an emboldened Putin might invade Ukraine. While Washington and NATO are not likely to react militarily to further Russian aggression in Ukraine, a move on Latvia, Estonia, or Lithuania—all NATO allies—could mean war. Not reacting would leave NATO meaningless and invite further Russian aggression. Weakness begs for bullying. First, modernize the nuclear arsenal to maintain the credibility of our deterrence. Second, build a NATO air base in Poland and base a squadron of USAF F-22s on it. Third, bolster Polish defenses with additional F-16 fighters and provide them a couple of squadron of A-10 Warthog tank-busting attack planes. Also, arm Poland with enough M-1A2 Abrams tanks to discourage Russia from its historic propensity for blitzkrieg type invasions. If invaded, the Poles will fight and make Russia pay dearly. Fourth, end the scheduled reduction of the U.S. Army from its current level of 485,000 to something between 420,000 and 450,000. Build the Army back to a force of at least 550,000. While ISIS and other terrorist groups—and rogue regimes in North Korea and Iran—remain serious threats, Russia and China can challenge our nation’s existence. If Russia is deterred, China and lesser threats are also significantly lessened. But if terrorists and rogue nations are not deterred, then the world’s real bullies are emboldened. The old Latin adage, “If you want peace, prepare for war,” still applies to a world as dangerous today as it was in the fifth century when Roman patrician Publius Flavius Vegetius Renatus urged military strength to meet the threat posed by Goths. Dr. Earl Tilford is a military historian and fellow for the Middle East & terrorism with The Center for Vision & Values at Grove City College. He currently lives in Tuscaloosa, Alabama where he is writing a history of the University of Alabama in the 1960s. A retired Air Force intelligence officer, Dr. Tilford earned his PhD in American and European military history at George Washington University. From 1993 to 2001, he served as Director of Research at the U.S. Army’s Strategic Studies Institute. In 2001, he left Government service for a professorship at Grove City College, where he taught courses in military history, national security, and international and domestic terrorism and counter-terrorism.